The Schwarzwald (Black Forest) is known for its Forellen as the many small rivers and streams that flow through the countryside are abundant with trout. Farms have built their own ponds with the trout filling them from those streams passing through. Many a Gasthaus has its own Forellen pond or has a source just down the road. 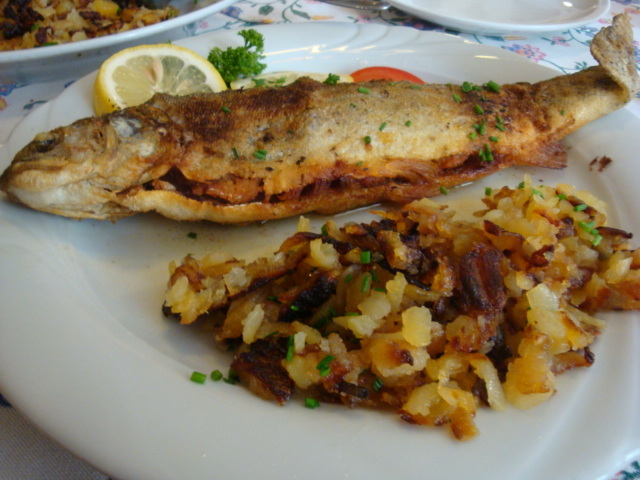 Most of the Gasthäuser in our immediate vicinity do not have trout on their menus, but only 25 minutes or so from us, in the hills, there are several that specialize in them. Some local Gasthäuser, however, do offer them from time to time. Trout served as a warm meal will be either Forellen Blau or Forellen Müllerin. Forellen Blau is poached and is faintly blue in colour when cooked (blau means blue in English). Müllerin means it is fried or sauteed but the word itself actually means miller's wife. No doubt at some time a miller's wife fried some trout and the name stuck. The trout will be served whole, with the head and tail still on. A small dish of melted butter will usually be served on the side, though occasionally the butter will be poured over the trout on the plate. Boiled potatoes will always accompany it. Every so often I crave trout for supper, so off we go to one of the places we know and where it is excellent. One of my favourite memories is of my birthday one year. In the country, amongst the hills and woods, we went to the Gasthof Freiamter Hof. I had trout on my mind. Unfortunately, the Gasthof didn't have any on hand. They asked me to wait a few minutes and they would see what they could do. They phoned a nearby farmer who had a trout farm, and the next thing I knew a trout was frying away in the kitchen for me. Along with the potatoes, a salad and a glass of Weissherbst wine, it was a delicious and memorable birthday supper. I often order Forellen Müllerin mit Mandeln (trout with shaved almonds) if on the menu. 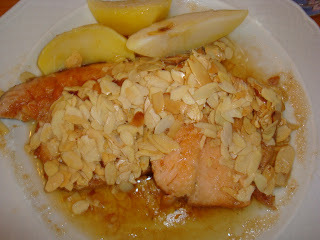 The almonds are browned first and then added to the butter in the pan just before the trout is served. The almonds and butter will then be poured over the fish on the plate. 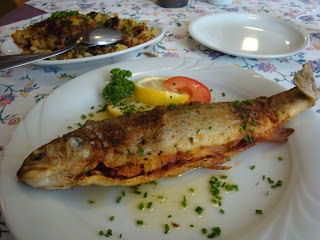 I also enjoy Bratkartoffeln (pan-fried potatoes) with trout and sometimes ask for them instead of the boiled potatoes. However, boiled are the norm. You'll note that the trout are served with the head and tail still on. The head and tail are ways to identify that it is really trout that you are being served. I grew up eating trout and other fish in Prince Edward Island, Canada, though fish was never served with the head on. 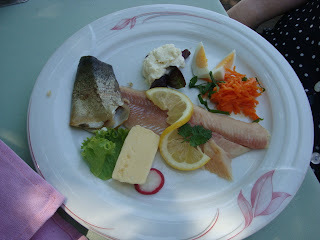 The trout below with Bratkartoffeln that I had at the Gasthaus zur Waldlust this past summer. Often on a New Year's Eve when we stay at home, one of the courses for our special menu will be smoked trout with creamed horseradish, accompanied by my own cranberry sauce. We buy the smoked trout from a farmer and for the horseradish sauce, we buy a jar of horseradish and mix some of it with whipped cream. Delicious! (The horseradish comes from a small town about 35 minutes north of Lahr.) We served that to guests in Nova Scotia one fall, the trout from our own trout pond and the smoking done in Hans's smoker. The smoked trout fillet with horseradish and accompaniments was served at the Gasthaus Eiche on the Langenhard last spring. Years ago, in the mid 1970s, shortly after arriving on our posting to Germany, friends took us to a small farm Gasthaus in the hills. It was night time and we had no idea where we were as we had turned off the main road onto a narrow country lane. We drove through a farmer's yard to reach the Gasthaus, which was at the very end of that small road. It was a tiny place with just a few tables where we sat on benches on each side. Their specialty was Forellen. We all ordered the same, Forellen Müllerin. The fish arrived, one large one each, with the head and tail intact. Then a huge bowl of boiled potatoes arrived along with pitchers of hot, melted butter. Oh, everything was superb! We weren't finished yet, though. They removed the plates filled with bones and then served us another trout each along with another huge bowl of boiled potatoes and jugs of hot butter. Luckily we were all young enough to have healthy appetites! That lovely little farm Gasthaus in Prinzbach was torn down in the 1980s and rebuilt into a large and beautiful one, but in the doing it lost its atmosphere--at least for us--though it is a lovely spot still and attracts many guests. Our friend Martin Grimm, chef and Wirt (owner) serves a fantastic steak at the Gasthaus Engel in Dörlinbach, about 20 kilometers from Lahr. About twenty years ago one had to go to a high-priced restaurant or to a Gasthaus that specialized in steak (few and far between then) to get a good one. Steak is still not a specialty in Germany, but now you can get a very good one in many local Gasthäuser, not just in better restaurants and, of course, some restaurants do specialize in it. Beef has improved greatly in tenderness and flavour. 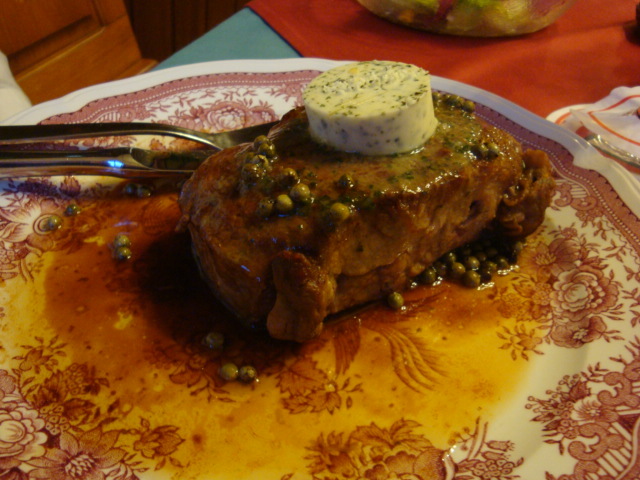 The picture below is of a fillet steak with green peppers, Krauterbutter and a Cognac sauce. Martin's steak is as good as we've ever had. We have taken many friends and acquaintances there over the years and all go back again. 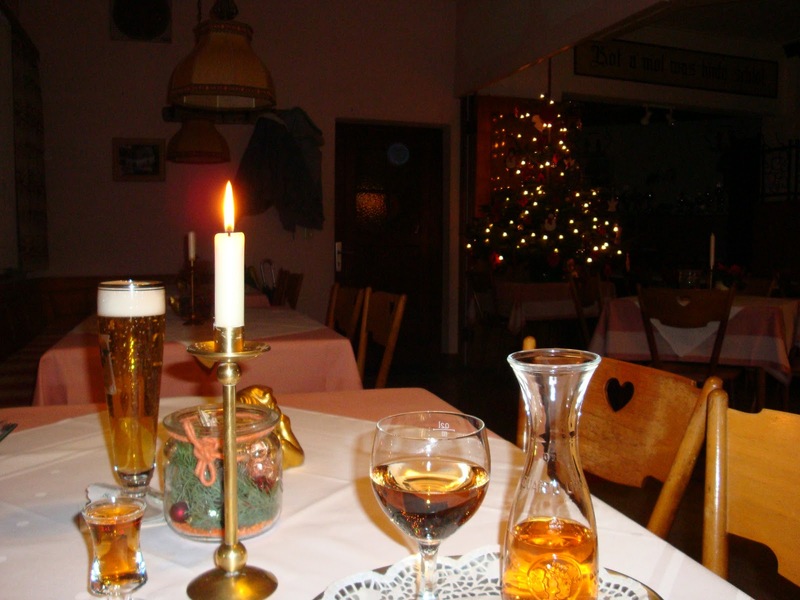 He and his wife, Monika, and his brother Uli run the Gasthaus and are always present. It isn't a fancy restaurant but a local "gut bürgerliches" Gasthaus, one that isn't pretentious and serves home-style cooking. He's a great cook; nearly everything he offers is delicious. He buys the best cut of beef he can get. When we go there to eat, Hans always asks how his steak is that day. If Martin says it is excellent, that is what we have. We mostly order his Rumpsteak with Krauterbutter (herb butter) or Zwiebeln (onions). I order it with both the butter and onions, plus sauce; Hans orders it without sauce and without onions, just the herbed butter. From time to time we order his fillet steak with green peppers and a Cognac sauce, more expensive but excellent. 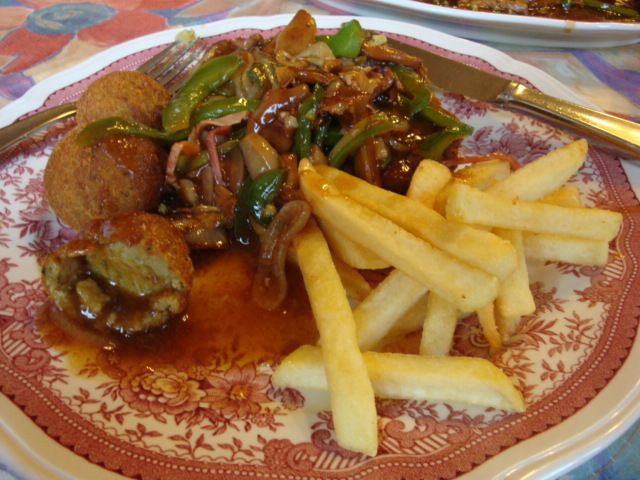 Along with those steaks, we always order their homemade Kroketten (potato croquettes). Martin's mother, Frau Grimm, and his wife, Monika, always made them together every Friday or Saturday, enough to do all week. They would freeze them uncooked. After his mother died last spring, Monika made them herself with some help from Martin. The secret (from his mother) is lots and lots of parsley, very different from any potato croquettes you get anywhere, including those from cookbooks. They are so good that we think about them even before we go there, just as we think about those delicious steaks. It is seldom that we can eat all that they serve us, so invariably we take half home with us. About two weeks ago or so, we were served 16 croquettes! The recipe below is from Frau Grimm, who gave it to me herself in 1997. It is without a lot of amounts given. If you try them, it will perhaps be a bit of trial and error. Form into balls. If too soft, add a little more flour. Chill. Roll the balls in fine bread crumbs. Heat oil in a deep fryer to 180C/350F. Deep fry until golden. They will be crisp on the outside and soft on the inside. I did make these and they were good, but not as good as Frau Grimm's. One needs to get the right consistency. Tip: Frau Grimm said that you can cook these in boiling water as well; then they are dumplings. I haven't tried that. The picture below shows the croquettes with a greenish hue--from the parsley. We order these as well with the Zigeurnerschnitzel, as shown below. Enjoy some trout or a steak at home with a nice bottle of wine. With the trout, I enjoy Weissherbst (a rose wine) but a Weisserburgunder is also excellent. That is similar to Chablis but with more flavour. Trout is rich and I think requires a wine that is also rich in taste. With the steak, a red Bordeaux or a full-bodied Burgundy wine. Perhaps with a beer beforehand as Hans often does. The picture below shows Annabelle contemplating the burning candles. This is Second Advent with only two weekends before Christmas. I so miss my Rumpsteak. I used to order it with Krauterbutter. The closest I've had to that since leaving Germany, is the Filet Mingnot with a herbed butter on top. I had it at Painter's Lodge in Campbell River about 9 years ago. It practically melted in my mouth. I savoured every bite of it and as I ate the steak I was reminded of my time in Germany and the countless times I was able to enjoy an excellent Rumpsteak.